This is the way the world ends: with a nanosecond of computer error in a Defense Department laboratory and a million casual contacts that form the links in a chain letter of death.And here is the bleak new world of the day after: a world stripped of its institutions and emptied of 99 percent of its people. A world in which a handful of panicky survivors choose sides -- or are chosen. 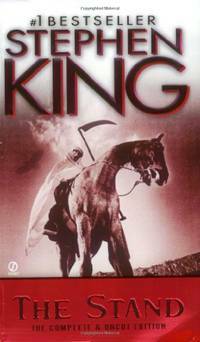 A world in which good rides on the frail shoulders of the 108-year-old Mother Abigail -- and the worst nightmares of evil are embodied in a man with a lethal smile and unspeakable powers: Randall Flagg, the dark man.In 1978 Stephen King published The Stand, the novel that is now considered to be one of his finest works. 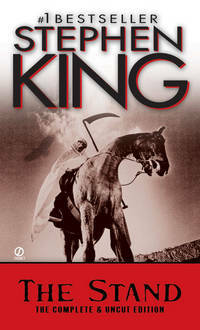 But as it was first published, The Stand was incomplete, since more than 150,000 words had been cut from the original manuscript.Now Stephen King's apocalyptic vision of a world blasted by plague and embroiled in an elemental struggle between good and evil has been restored to its entirety. 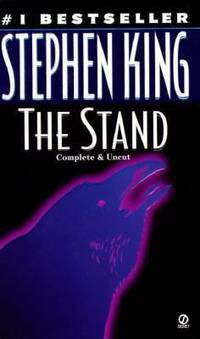 The Stand : The Complete And Uncut Edition includes more than five hundred pages of material previously deleted, along with new material that King added as he reworked the manuscript for a new generation. It gives us new characters and endows familiar ones with new depths. It has a new beginning and a new ending. What emerges is a gripping work with the scope and moral comlexity of a true epic.For hundreds of thousands of fans who read The Stand in its original version and wanted more, this new edition is Stephen King's gift. And those who are reading The Stand for the first time will discover a triumphant and eerily plausible work of the imagination that takes on the issues that will determine our survival.From the Hardcover edition. Penguin Publishing Group, 1991. Mass Market Paperback. Acceptable. Disclaimer:A readable copy. All pages are intact, and the cover is intact. Pages can include considerable notes-in pen or highlighter-but the notes cannot obscure the text. At ThriftBooks, our motto is: Read More, Spend Less.Dust jacket quality is not guaranteed. Penguin Publishing Group, 1991. Mass Market Paperback. Acceptable. Disclaimer:A readable copy. All pages are intact, and the cover is intact. Pages can include considerable notes-in pen or highlighter-but the notes cannot obscure the text. An ex-library book and may have standard library stamps and/or stickers. At ThriftBooks, our motto is: Read More, Spend Less.Dust jacket quality is not guaranteed. Signet, May 1991. Mass Market Paperback . Used - Good. Slight wear. May have minor sticker residue, marks, or writing. Our service is second to none because we use easy to remove inventory tags and ship every day so your book arrives quicker! As an independent bookstore in the Midwest, we thank you for the support. Satisfaction guaranteed in all transactions. Let us know what we can do to help! Signet. Mass Market Paperback. 0451169530 . Fine. 1991-05-07. Revised. Signet. Used - Very Good. Great condition for a used book! Minimal wear. New York, NY, U.S.A.: Signet Books, 1991. Forty-second Printing. Mass Market Paperback. Good -. New York, NY, U.S.A.: Signet Books, 1991. Twenty-eighth Printing. Mass Market Paperback. Good- Ex-Lib (Protective Film). Signet, 1991-05-07. Mass Market Paperback. Acceptable. Remarkably worn and marked but legible. Ships promptly. Signet, May 1991. Paper Back . 2.1 PB worn -5%. Signet, 5/7/1991. Mass Market Paperback. Good. Paperback book in good condition. Some light shelf and use wear, including a small ding at top of spine near back cover, otherwise appears to be a good clean copy! Signet, 1991-05-07. Mass Market Paperback. Good. Signet, May 1991. Paper Back . 5.1 PB premium +10%. Signet. Used - Acceptable. Ships from the UK. Shows definite wear, and perhaps considerable marking on inside. 100% Money Back Guarantee. Your purchase also supports literacy charities. Signet. MASS MARKET PAPERBACK. 0451169530 . Fine. Signet. Mass Market Paperback. 0451169530 Please allow 4 - 14 business days for Standard shipping, within the US. Thank you for supporting our small, family-owned business! . Fair. 1991-05-07. Revised. Signet. MASS MARKET PAPERBACK. 0451169530 Like New Condition. . Fine.